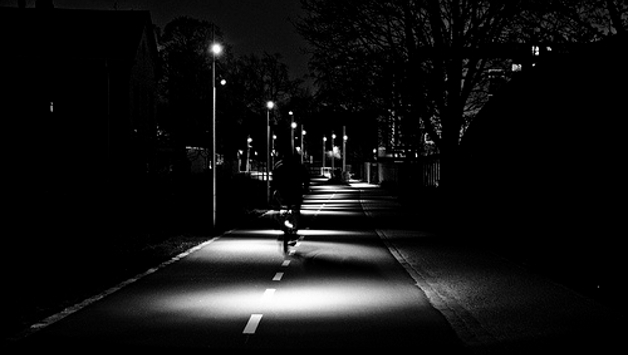 Cycling in the dark, our fragile minds play tricks on us. With darkness comes fear. Is that a pack wolves on my tail? We hear noises that are not there or we sense an unknown evil at every corner. Or a pothole. Rational by day, come night we’re a gibbering mess, a child hiding beneath the bedsheets afraid to move for fear of the bogey man. Many a cyclist retreats to their cave come nightfall, not too dissimilar to the times before electricity when people were reluctant to go out at night for fear of thieves stalking the shadows. If not robbed, people got lost or fell crippled into ditches. Such fears plague the night cyclist too but if we can conquer such primal fears there is much to be discovered cycling beneath moonlight. The world is a strange place, even in daylight. Come nightfall we see new dimensions and, alone on a quiet country lane, the cyclist’s world is reduced to little more than a narrow beam of light. We miss much yet we discover so much more. It was with such anticipation that I decided to tackle the Duwnich Dynamo once again, an unorganised, 200km ride through the night and early morning hours, arriving at the beach for sunrise (and a fry up). A few thousand caffeinated cyclists / mentalists meet casually in Hackney before slowly filtering out towards the sea one by one, bats leaving the colony for the night. There is no official start time. No starting fee. No marshals. No charities. No chest beating. The fact the ride is semi-unorganised is brilliant in many a way. One, that it actually happens. Two, it’s free so you can skip a punishing night if the weather is looking a little iffy and three, you don’t have that foreboding sense of competitiveness you get with most sportives. Oh and four, it is actually very well organised with a feed and drink stop half way through, coaches to get you back to London and an open cafe at 4am at the beach. The usual weather watch begins a week prior to the big night. You’re a meteorologist analysing isobars, looking for continental cloud patterns, searching every weather source in the vain hope one of them will give you the weather you desire rather than the foreboding black clouds and three rain drops. They don’t. A long night awaits. 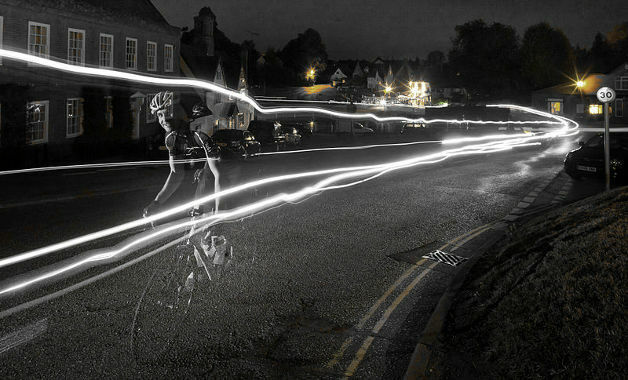 Look out for laser beams on the Dunwich Dynamo. They burn. Riding to Dunwich on the east coast of my tiny island is quite a feat at 200 km (or 120 miles for us imperial types). In total my route was closer to 160, by far the furthest I’ve ever cycled. I even out endured my Garmin, the battery struggling to record my first 150. Distance however was only part of my worries. Add to that the dimension of cycling overnight through biblical rain storms and arriving at the beach before sunrise and you have a ride internet folk younger than I might call Epic. Or Awesome. Like, really. Yet numbers and words do little justice to what is a beautiful ride. Sublime. The route covers many of the same Essex country lanes I tackle on my regular Sunday rides and yet at night, beneath a full moon, the corn fields and narrow lanes feel alive (although this year was very dark with cloud dominating the sky). Bird song is replaced by an occasional owl hoot, car traffic shushed in favour of the steady rhythm of rubber on tarmac. You follow a conga line of red blinking stop lights. Stop falling asleep they warn. Here and there, the tsssk of a can opening, liquid energy, nitro, taurine, guarana, glucose, ginseng, caffeine, Haribo tea, whatever we can get our hands on to keep the wheels turning and our eyes open. Sleep deprived, our mind plays trick on us. Bends become difficult to see in the dark, our eyes slow to focus, our reactions equal to that of a hungover sloth on diazepam. The strangest sensation is encountering a hill climb in the dark, for we do not see the gradient change we only feel it when the angle of our bike changes, our cadence slowing, breathing quickening, the summit an equal surprise. 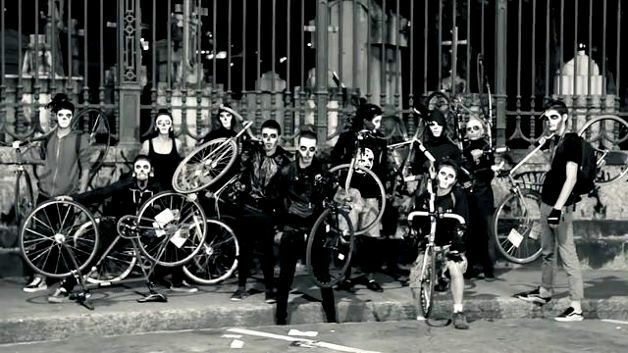 Onward we ride, a silent zombie peloton pushing ourselves to the limit. From the darkness, a hushed voice. We’ve missed a turn. There’s no swearing, no sighing, just the recognition that we must get back on track, worker ants following their trail, our only job to reach the coast awake. Occasional light houses in the dark empty sea of the blackness glimmer at us, a kind soul voluntarily on duty in their garden with hot tea and bacon sandwiches for the riders. We see their smiles even in the darkness, feel their warmth. Hungry for energy but we’re so tired we can barely chew. We think the snack tastes good but we’re not entirely sure, we are a car refuelling, kilojoules and calories all we acknowledge. Not much further we mumble to ourselves, an eye on the horizon, looking for the sun, for we must be beat it to the sea. Hours later we arrive, but it could have been days, weeks perhaps. We remember not when we last slept and we’re not even sure we’re awake now. Wheels no longer turning, eye lids heavy, they crash at every opportunity. Micro sleeps. Jolts. Coffee, thick and black, oil for the weary motor. Some sleep on the beach, others eat an English breakfast, some turn around and pedal back, iron will, steel calves, lead head. I’d recommend the ride back to Ipswich train station which is beautiful, even if the thought of an extra 30 miles whilst half asleep is not very appealing (beats waiting for the coach). This year there seemed to be far fewer cyclists than my first DunRun in 2011. The wise no doubt stayed tucked up at home to avoid the forecast of heavy rain. Although most riders I spoke to were lucky and missed the rain altogether, others less so. I was one of the others. Bah. The heavens opened and a biblical storm struck two hours into the ride. The remainder of the night was damp to say the least. Fortunately there were jovial locals lining some of the streets to hand out high fives, along with an amazing fireworks show that lit up the skies as if to celebrate our endeavours. Even though the dazzling pyrotechnic show had nothing to do with us, each rider smiled, for it was ours more than it was anybody else’s for few could have taken such pleasure in the sight as the weary cyclist. When the heavens closed, we rode through low lying mist, a ghostly peloton haunting the narrow lanes. Approaching the coast, the sky lit up for a second time, this time Mother Nature’s impressive light show. Lightning. Eerie. Would I recommend the Dunwich Dynamo in the wet? Maybe, if it was your first. It goes without saying it’s much more enjoyable (and safer too) in the dry. In addition to wet corners, you are also robbed of moonlight, which makes some of the lanes very dark indeed (my front light was so weak I was actually able to see more of the road courtesy of other riders’ rear red lights!). But with the event being free and semi-organised you can easily be the boss and decide exactly when you will ride the Dynamo. For you must ride the Dynamo. Where else did the inspiration come from for his song, Not Dark Light Yet? I found myself singing an adapted version of this Dylan classic for pretty much the last 50 miles. Excerpt below. Don’t get lost! Here you go, this is the Dunwich Dynamo gpx route for your Garmin, courtesy of some tired legs. This includes a tired ride back to Ipswich. You always feel like you are travelling faster at night! 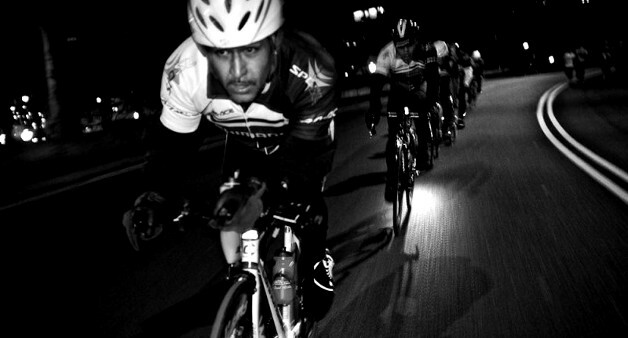 You don’t have to ride throughout the entire night to enjoy pedalling on the dark side. Get yourself a super bright spotlight for the front bars. The more you see, the less you’ll hit. Invest in a decent front light set. Or follow somebody who has. Dip that headlight. Don’t blind other road users, cyclists and drivers alike. Make sure your front light is pointing at the road and not my eyes – same goes for your rear light! What is it about people using radioactive rear lights? Blinding. Wear reflective clothing. I’m not talking high viz here, which won’t help you a great deal in the dark. Some strips of reflective clothing will attract the light of approaching vehicles (rather than the bumper of passing vehicles). You could also invest in some reflective tape for your bike – readily available from eBay and not too unattractive by day. Watch out for animals. They like roaming at night when most of us pesky humans are tucked up in our warm houses. You may well startle them which means they’ll startle you. Check your light batteries. It’s a long slow ride home with no front light and a dangerous night with no rear light. Take spare batteries if need be. Avoid roads with too many obstructions, unless of course you’re practising slalom. Take your glasses off when it rains. Wet specs are useless in the glare of headlights. Similarly, wear a peaked cap to keep the rain out of your eyes. Maintain your machine. Bike maintenance is difficult enough in a fully lit garage let alone in the darkness of a lonely country lane. Become a werewolf. Ride on moonlit nights. Follow the full moon for better vision and an ethereal glow on once familiar landscapes. Be afraid, be quick. Yes, there is a particular brand of killer who rides carbon and stabs steel. He’s after your blood, so up that cadence and topple that Strava KOM before they get you, you paranoid freak! See the unseeable. Stare into the blackness and marvel at how once familiar surrounds now look and feel so different. Slow down on descents. You never know what awaits and just because you’re out at night doesn’t give you cat-like reflexes. Shut one eye if you think you might be dazzled by an oncoming vehicle. Ride in the middle of the road to avoid the majority of potholes and drains. Follow that central white line to avoid getting familiar with the near side bushes. This stop-start time-lapse video captures some of the magic of the ride. Without the lactic acid in the legs and the bags beneath the eyes. There’s no climatic beach scene which is just as well, because you have to the ride the Dynamo for such pleasures. Strange and otherworldly. I’ll leave it to you I think. 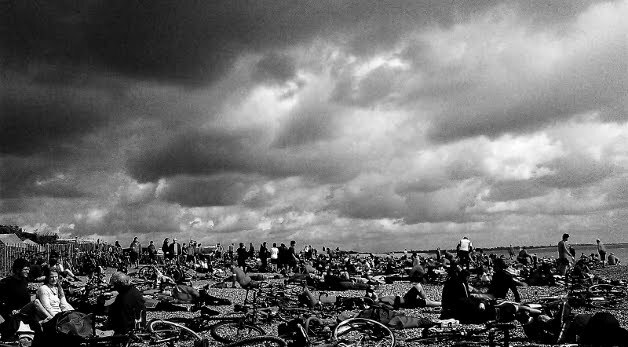 The beauty of the Dunwich Dynamo is the fact that you see all sorts of riders out. Tandems, folding bikes, walking bikes (seriously, have you seen these things?). There were young and old alike. Highly recommended. Cool! I love riding at night. Thank you CC, much appreciated reblogging of the darkside! Great write up – cheers sir! 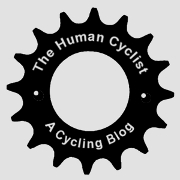 Hi Ian, glad you liked the blog and happy for you to link to the gif, the copyright belongs to Strava rather than me! Amazing though isn’t it? And top effort on completing the DunRun after a party until 11pm. I am impressed!